Dorante enters his eighth season in the Yankees' organization and second at the helm of the Pulaski Yankees. He was named 2017 Appalachian League Manager of the Year during his first stint in Pulaski. He spent the 2018 season as the bullpen coach for the Trenton Thunder (Double-A), where he previously served as pitching coach for the 2012 and 2013 seasons, helping the Thunder to an Eastern League Championship in 2013. Dorante was manager of the Charleston RiverDogs (Single-A) from 2014-2016. Signed as a non-drafted free agent in 1986 by Boston, Dorante played six minor league seasons in the Red Sox organization. 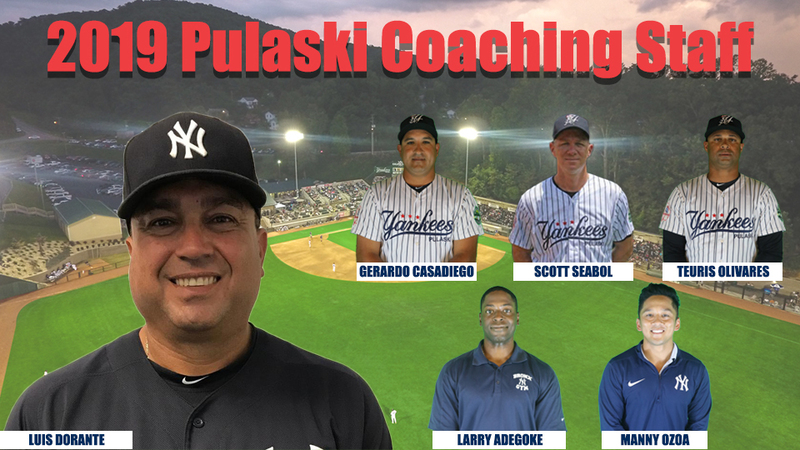 After spending 2018 with the RiverDogs, hitting coach Scott Seabol returns to Pulaski, where he began his professional coaching career in 2017. Seabol was selected by the Yankees in the 88th round of the 1996 First-Year Player Draft and appeared in 60 Major League games with the Yankees (2001) and Cardinals (2005). He played 12 minor league seasons with the Yankees, Brewers, Cardinals, and Marlins. Olivares begins his ninth season in the Yankees organization, returning to Pulaski in the same role he held during the 2018 campaign. He served as defensive coach for the Staten Island Yankees in 2016 and 2017 after coaching five seasons in the DSL. Olivares was signed by the Yankees as a non-drafted free agent in 1995 and played nine seasons in the Yankees farm system before playing six seasons in the independent Atlantic League. Strength and conditioning coach Larry Adegoke and athletic trainer Manny Ozoa return to Pulaski for their second and fourth seasons, respectively. Adegoke earned his B.S. in exercise science from Kennesaw State University and his M.S. in exercise and nutrition from the University of Tampa. Prior to joining the Yankees organization full-time, he served as the team's performance science assistant in the spring of 2017. Ozoa earned his bachelor's degree in athletic training from Illinois State University and his master's degree in medical sciences with a concentration in athletic training and adolescent athletics from the University of South Florida. He spends his offseasons as a seasonal athletic trainer for the Tampa Bay Buccaneers. Tom Kackley will be the Pulaski Yankees clubhouse manager in 2019 after serving in the same role with the Trenton Thunder. The Yankees' 2019 video manager is still to be determined. 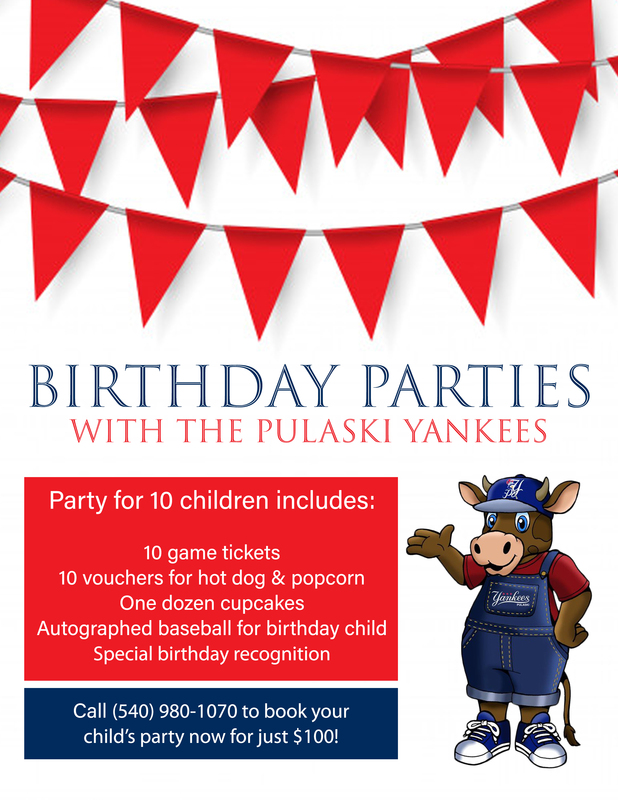 The 2019 Pulaski Yankees season begins on June 18 at Johnson City. The Yankees home opener at Motor Mile Field at Calfee Park is Friday, June 21 vs. Bluefield. Flex tickets and season tickets are on sale now by phone, in office, or at pulaskiyankees.net; individual game tickets will go on sale in April.